Raise your hand if your house is company ready clean, all the time. If you raised your hand, you can stop reading this post and go back to your bon bons, k? For the rest of you, is this a little bit more familiar? And how many of you, when doing a big deep cleaning, have kids who demand to know who's coming over? Back when I had two under two, I had to drop something off to another mom/friend pretty early in the morning. Every time I visited before, her house was always pristine. She opened the door a crack and held out her hand for my delivery but I could still into her living room. It looked like my living room. Like a toy store had exploded. And the sounds escaping her house? It was clear that mom was distracted and all heck was breaking loose. Another time, my sitter canceled and a different friend who always had a clean house said she could babysit but warned it was laundry day. It was like a laundry mat EXPLODED in her living room. Piles of clothes everywhere. And did I judge? You betcha! I had judged and found her worthy of my friendship. That's when I finally realized you had friends you cleaned up for, and friends you let see how you really live, complete with playdough stuck to the walls. But, this post isn't really about that. It's about how to really maximize those 10 minutes you spend trying to convince your guest you really do have a sparkling house all the time. 1. Designate a Disaster Room/Closet We've named ours the Closet of Doom. Also known as "Please do not open that door!" Many of my friends have one. It's a very well kept secret. That extra bedroom you claim is a "guest" room... yeah it's your Shove the Junk in there Real Quick Room. 2. Keep the view from the front door clean This trick comes in handy for those who aren't really gaining entrance to the house. Just let them see enough that it looks clean from where they stand. We do this with our backyard. When the weeds start to grow a bit too high and The Boy hasn't mowed, I send the little ones out to pull weeds in the section visible from the street...just to make sure we're not given a citation from the city. 3. Company Couch Cushions Have one side of the couch cushions for family. The other side from company. The company side is the one without the stains and spills. When the guests leave, simply flip the cushions back to the family side. 4. The Emergency Tub Kids rooms giving you trouble? Place a large lidded rubber tub in each room. When you get the 10 minute warning of guests, throw everything from the floors and flat surfaces into the tub and snap the lid shut. Be sure to go through the bin later. This tip was given to me by a realtor in how to keep a house ready for showings when you have kids. 5. The Tub in an Emergency Ahhh the unconventional storage places. A good friend recently confessed that at a recent party she hosted, she had a pile of stuff and not enough time. It went into her dryer. Don't underestimate the power of stuffing things in places they don't belong and you are 100 percent sure where no one will look. At our house, I have the old pack' n 'play in my room...it's usually full of several loads of laundry that needs folding. So, I cover it with fabric and pretend it's a table. Out of sight, out of mind. 6. If it smells clean, it is clean! Once you've successfully hidden everything, swept and well...let's face it, thought about dusting but never gotten around to it, the final fake out cleaning trick is to spray stinky cleaners near the front door and give them a quick wipe. Then, spray an air freshener. You need to live just a hint of disinfectant cleaner so they are aware the house has been cleaned, but enough air freshener to make it look like you're trying to disguise the smell as a courtesy to your guests. I steamclean my stairs carpet every week bc its the first thing anyone sees when I open the door. That fools them into thinking I vacuum everywhere else regularly. I'll do the quick-spray-of-cleaner and then turn on some Scentsy. Baking something yummy is also good- seen "Leap Year", when the realtor tells the client to throw a whole roll of fridge cookie dough into the oven before a showing? I often make sure to leave a stray toy or 2 in sight, so people realize I am a human living in a house with 4 rowdy kids. Love it! Thanks for the tips, especially keeping the view from the front door clean. I'll have to work on that so I can fool my guests. I LOVE this! 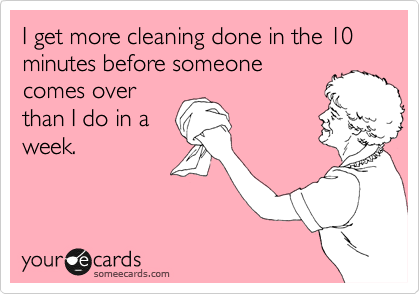 I hate cleaning, because it's so pointless (yet necessary) when you have little ones. Thanks for sharing! #3 & #4 are genius. I am totally stealing #4 but our couch cushions don't flip. I am not above putting everything that's randomly out of place in a laundry basket and putting in our bedroom and shutting the door. I always vacuum the rug in the living room, because that makes the whole room look cleaner. I needed this post. You see I have a craft fair on the 4th of July, and as I type a 10 by 10 enclosed canopy sits in my living room. My dishes, laundry, and other things have been pushed aside so that I can get my booth ready for the fair. LOL you are too funny, thanks for sharing these fun tips. I love number 6, if it smells clean it is clean, that is so true! I sometimes put Pinesol and water in the sink and let it sit there for awhile, then it smells as though I mopped my floor, haha! My mom always shoved stuff in the oven to hide things until the dinner party was over. We always called it "the BLITZ." I have fond memories of the four of us running around like crazy throwing misplaced items into laundry baskets that we then shoved either into closets or the basement! Once I found a blitz basket in an odd corner of the dark basement storage room a good couple of years later. I remember unloading the items while saying to myself "so that's where that was!" Funny, funny! But, oh, so true! I never thought of having a "regular" side and a "guest" side to couch cushions. Great idea. We have 2 huge dogs that lay on our furniture so I finally found sound nice furniture covers that I use. I tried so many different types of covers but didn't like any of them. I found the ones I use in a magazine and took a chance to order them. Good decision. Very simple design. No tugging and pulling to get it on. It just lays over the cushions and up the back and over; has arms that just lay over and down. And the best part is that when company comes I just whip them right off the couch and hide them in my linen closet. No animal hair on the furniture! Girl I feel your pain. My house has gone to pots since my boys are home this summer. Best part is, I really don't care...It will get done when it gets done. I am too busy enjoying summer! Thanks for sharing with the newbie party. Hahaha. We have what used to be called, "the Room of Shame." Then we converted it back from 100% storage to storage + guest room. It is marginally better... just. My stash is under the bed in there for a lot of things (when the house was for sale), or the entire room if need be. We have an emergency tub, too! I have been known to stuff things into a closet if time is short, too. If I am expecting company, I either brew coffee or pop some ready bake cookies into the oven so the smell distracts them from everything else...hehe. Great article...love the company couch cushions..lol. Great to see someone else who thinks just like me lol!! !